Various predictions keep us guessing at the current Keeping up on the current status of the wearable industry and market. CCS Insight projecting that the wearables market will grow to $34 billion by 2020. So in the spirit of “what we did on our summer vacation”….we visited (and participated) in three recent tech conferences around the country. Wearable technology, as we know it, could arguably be said to have been begun on a large consumer scale with activity trackers and fitness. Obviously, the market has expanded exponentially, as it has evolved into the healthcare industry, the fashion industry, AR and VR. But as the industry explodes, these gatherings addressed not only the increasing accomplishments of the participants, but the challenges that these wearable pioneers continue to face. Most recently, we were in San Francisco for the 29th edition of the global WT/Wearable Technologies Conference Series. Perhaps the most compelling in terms of the entire scope of the wearable industry, the range of relevant topics was impressive. From Cambridge Consultants’ discussion of micro-implants and an “ecosystem” of body sensors in the foreseeable future to Viewpoint system’s eye “hyper-tracking” and the “digitizing of human behavior,” the speed with which wearable technology is bringing us into what used to be considered “science fiction” is suddenly apparent. The capacity to overcome challenges was equally addressed, as Varta engaged us with the “evolution of batteries,” Energous explained the ecosystem of “wireless charging” and Valencell discussed the lessons learned in in integrating biometrics into wearables. The nucleus of a burgeoning wearable market, i.e. the confluence of design and technology, and the goal of consummate comfort and wearability were issues relevant to numerous panels over the course of the conference. 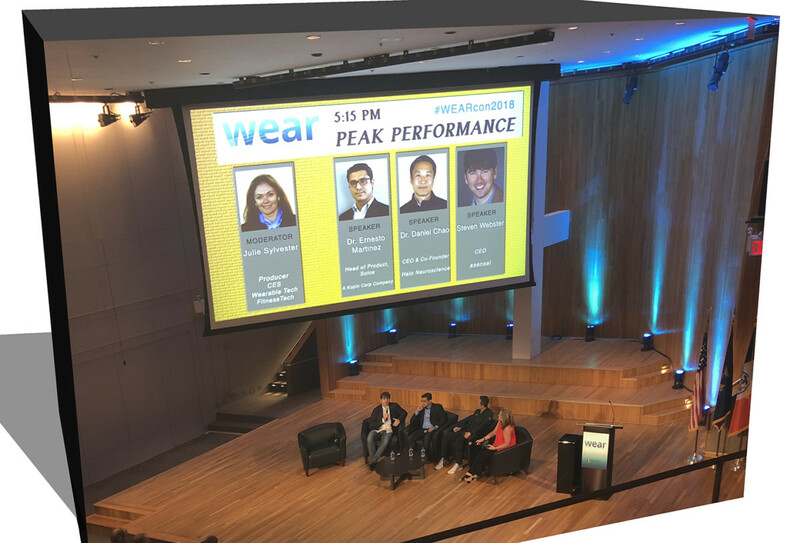 The WEAR 2018 conference in New York, subtitled “The Thread That Ties Us Together,” focused more on technology and fabric, the advances and challenges between the two, not only in communication but in dealing with a necessity of standards and regulation that are quickly becoming a primary element in the wearable market. We heard much about fabrics and tech affecting how we live: OMsignal’s talk concerning “bio-sensing” through smartwear, Drexel University’s Genevieve Dion’s discussion of textile devices revolutionizing how we work and interact with each other, Myant’s Tony Chahine talking about the “disruption” that is coming with the convergence of “textile computing” and AI. Halo Neuroscience, Solos and asensei displayed how wearable tech, AI and connected coaching are changing the way that elite and professional athletes are training. From athletes to fashionistas, speakers from Levi’s and Wearable X, among others, explained the parade of technology into fashion as sensors are becoming decoration, solar powered charging is a reality, AI can be fashionable and consumer friendly. Finally, Digital Hollywood in Los Angeles, proved another example of wearable technology proliferating even into the entertainment industry. As a delivery system, as a method of collecting data, the potential of wearables is limitless but, as improvements in battery life become a reality, methods of production and manufacturing become streamlined, wearables and the wearables market will reach their potential.